Royal Geelong Yacht Club (RGYC) has won its bid to host a prestigious major international sailing event in 2022 – the annual Fireball World Championship. The two person ‘off the beach’ racing series has only been held in Australia six times since its inception in 1966 and was last held in Australia in 2012. The Fireball is an exciting 16ft long 2 person dinghy. It is a class very well supported around the world and in Australia. The class association embraces involvement from female, male, matured aged and youth sailors. Currently, the reigning National Champion is the Victorian husband & wife team of Heather MacFarlane & Chris Payne. According to RGYC Commodore, Chris Williams the Fireball World Championship will attract 150 competitors to the Geelong and deliver almost $1m in economic benefit to the city over the 13 days of competition in February, 2022. “This is another great win for the Club and another event that will put Geelong on the world stage with as many as 50 international sailors set to join sailors from right around Australia and head to Geelong to compete,” he says. RGYC has already secured the Fireball National Championships in 2019 and is currently also in the bidding to deliver the 49er/NACRA World Titles in January, 2020 and the Laser Masters World Titles in March, 2020. 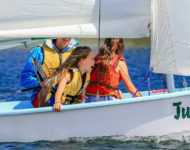 If RGYC is successful in winning all three World Championship Sailing events it’s targeting, they could bring more than 700 visitors and an estimated economic benefit of almost $3.7million to Geelong. “We’ve recently been awarded the title of Victoria’s Yacht Club of the Year and winning the Fireball Worlds will certainly help to cement Geelong’s strong reputation as a top destination for world-class sailing action,” says Mr Williams. Chris Payne of the Australian Fireballs Association also welcomed the win as a coup for Geelong. RGYC is supported in the bidding process for the World Titles by Geelong Major Events and the State Government of Victoria.